Background and objectives: The common finding that low achieved hemoglobin in observational studies and high target hemoglobin in randomized trials each were associated with increased mortality and high epoetin dosage has suggested the possibility that high epoetin dosage might explain the increased mortality risk. Design, setting, participants, & measurements: We considered data from 18,454 patients who were ≥65 yr, were in the US Renal Data System, started hemodialysis in 2003, and survived 3 mo on dialysis. We estimated the association between cumulative average epoetin dosage and survival through the subsequent 9 mo by using inverse probability weighting to adjust for time-dependent confounding by indication. Results: Survival was similar throughout the entire follow-up period for the three hypothetical treatment regimens selected: Low dosage 15,000 U/wk, medium dosage 30,000 U/wk, and high dosage 45,000 U/wk. Compared with a cumulative average dosage of 20,000 to 30,000 U/wk, the estimated hazard ratio (HR; 95% confidence interval [CI]) was 0.90 (0.52 to 1.54) for <10,000, 0.84 (0.67 to 1.05) for 10,000 to <20,000 U/wk, 0.96 (0.76 to 1.21) for 20,000 to <40,000 U/wk, and 0.91 (0.67 to 1.22) for >40,000 U/wk. In contrast, conventional unweighted models, which do not adequately adjust for time-dependent confounding by indication, indicated an association between high cumulative average epoetin dosage and increased mortality. Conclusions: Our findings suggest that, on average, epoetin dosages >30,000 U/wk do not confer additional harm or benefit in elderly hemodialysis patients. Randomized clinical trials (RCTs) of epoetin use among patients with chronic kidney disease have found a lower survival in patients who are assigned to complete versus partial correction of anemia (1,2); however, observational studies have found a greater survival in dialysis patients who achieve higher hematocrit levels (3–7). Thus, the seeming paradox is that targeting higher hematocrit levels via epoetin use is harmful, whereas achieving higher hematocrit levels is beneficial. Because in RCTs those who are targeted to higher hematocrit levels require higher epoetin dosages whereas in observational studies those who achieve higher hematocrit levels use lower dosages, some have suggested that higher epoetin dosages might be harmful (8–10). Estimating the effect of high epoetin dosages with an RCT would require that participants be assigned to a particular epoetin dosage regardless of achieved hematocrit level; however, in everyday clinical practice, physicians adjust the dosage on the basis of achieved hematocrit level and would be reluctant to enter patients into a trial in which patients with low hematocrit levels might receive low epoetin dosages. Conversely, estimating the effect of epoetin dosage on survival in observational studies requires careful measurement of and appropriate adjustment for confounding by indication as a result of time-varying hematocrit levels and other factors that determine subsequent epoetin dosage. In this article, we present estimates of the effect of epoetin dosage on survival among the elderly dialysis population in the United States. To adjust appropriately for measured confounding by indication, we used inverse probability weighting. We estimated the association between cumulative average epoetin dosage (U/wk) and survival of elderly patients. We selected patients who had initiated hemodialysis 3 mo before inclusion and followed their survival through the end of their first year on dialysis (i.e., we focused on the 9-mo period between their fourth and 12th month on hemodialysis). The US Renal Data System (USRDS) is a national resource that includes demographic and clinical data on patients with ESRD and their institutional providers of dialysis treatment. Medicare covers 93% of US dialysis patients, and the USRDS Medicare claims database includes data on monthly hematocrit levels and epoetin dosages that are administered for these patients. (USRDS web site: http://www.usrds.org, “Researcher's Guide to the USRDS Database” describes the variables, data source, collection methods, and validation studies.) We used USRDS standard analytic files for calendar years 2003 and 2004. Institutional claims, including treatment information, were used as the primary data set and merged with variables from patient, medical evidence, facility, and physician/supplier files from the USRDS core CD based on unique patient identifiers. We identified incident hemodialysis patients who were ≥65 yr and had their first ESRD service in 2003. We chose an elderly incident cohort so that we would have the complete data on their epoetin therapy (elderly patients are already enrolled in the Medicare program, unlike their younger counterparts who initiate dialysis, and do not have to wait for 3 mo before receiving Medicare dialysis benefits). Beginning in 2003, patients from hospital-based facilities might receive darbepoetin (Aranesp®; Amgen Inc., Thousand Oaks, CA) instead of epoetin alfa (11), the therapy of interest in this study, so we restricted our study population to patients who received dialysis care in free-standing facilities. Patients who did not receive their first outpatient dialysis claims in the first 90 d after being certified as having ESRD and those identified as having Medicare as a secondary payer were also excluded to ensure that we had the complete patient claims treatment history. The analysis was further restricted to patients who, during the first 3 mo on hemodialysis, did not have missing data, a history of HIV or cancer (studies suggest that patients with ESRD and HIV might respond differently to epoetin therapy compared with the ESRD population at large) (12–14), a change of dialysis modality, a kidney transplant, a change of dialysis provider, or a gap in billable dialysis services (defined as missing dialysis treatment or hospitalization information for ≥30 consecutive days). Follow-up started after 3 complete months of outpatient dialysis treatment and ended 9 mo later; at the time of death; at the time of censoring by change of dialysis modality (3.2% censored), a kidney transplant (0.5%), 60 d after change of dialysis provider (8.4%), or a gap in outpatient dialysis services (11.7%); or as a result of data anomalies (3%), whichever happened earliest. We could not use cause-specific mortality (e.g., cardiovascular mortality) as an outcome because the information on causes of death in the USRDS is not validated. We fit a pooled logistic model to estimate the probability of death at each month conditional on cumulative average log epoetin dosage (cubic splines with knots located at 5th, 25th, 75th, and 95th percentiles corresponding to weekly dosages of 3000, 8330, 22,900 and 46,950 U, respectively) through that month. For each patient and month, the cumulative average dosage was calculated as the total epoetin dosage received since the start of follow-up divided by the number of weeks elapsed. The model included covariates for month of follow-up (linear and quadratic terms) and their product (interaction) terms with the log epoetin dosage variables (log of zero dose was treated as zero). The model also included the non–time-varying covariates age (years) at ESRD onset, race (black, white, or other), gender, underlying cause of ESRD (diabetes, glomerulonephritis, hypertension, cystic kidney, or other), US geographic region (Northeast, Southeast, Midwest, or West), dialysis chain membership (five largest chains and small/nonchain facilities); hematocrit level (<30, 30 to <33, 33 to <36, 36 to <39, or ≥39%), patient weight (<61, 61 to <72, 72 to <84, or ≥84 kg), Charlson index score (in four groups, <3 to <6, 6 to <8, or ≥8), and presence of cardiovascular and noncardiovascular comorbidities (15) at the start of follow-up (cardiovascular comorbidities include cardiac arrest, congestive heart failure, cerebrovascular disease, cardiac dysrhythmia, pericarditis, peripheral vascular disease, ischemic heart disease, and myocardial infarction; noncardiovascular comorbidities include alcohol dependence, cancer, drug dependence, HIV, AIDS, inability to ambulate, inability to transfer, chronic obstructive pulmonary disease, tobacco use, diabetes, currently on insulin, diabetes, primary or contributing), and average monthly intravenous iron administered (obtained using Healthcare Common Procedure Coding System codes and categorized in quartiles as <450, 450 to <800, 800 to <1200, or ≥1200 mg), cumulative hospital days (0, 0 to <5, 5 to <10, or ≥10 d), and average epoetin dosage and number of administrations during the first 3 mo on dialysis. We then plotted the predicted survival under three hypothetical scenarios: All patients received a cumulative average dosage of (1) 15,000 U/wk, (2) 30,000 U/wk, and (3) 45,000 U/wk. These levels were selected to represent approximately low, average, and high dosages. To estimate average HRs during the entire follow-up, we also fitted the model without interaction terms and with continuous epoetin dosage replaced by a categorical variable with five levels: 0 to <10,000; 10,000 to <20,000; 20,000 to <30,000; 30,000 to <40,000; and ≥40,000 U/wk. We computed conservative 95% CIs by using a robust variance. Because high epoetin dosages are more likely to be prescribed to patients with higher mortality risk (e.g., with lower hematocrit) (6), the estimates from the regression model need to be adjusted for this time-dependent confounding by indication effect. To do so, one could add the time-varying confounders (e.g., hematocrit) as covariates in the logistic regression model; however, this standard approach might introduce bias because hematocrit is affected by previous epoetin treatment (and might be on the causal pathway between epoetin treatment and mortality) (16). We therefore used another method to adjust for time-dependent confounding by indication: Inverse probability weighting. Unlike the standard approach, inverse probability weighting appropriately adjusts for measured time-dependent confounders that are affected by previous epoetin therapy (e.g., previous hematocrit). Formally, under the assumption that all time-varying predictors of both epoetin therapy and hematocrit were included in the analysis (as described in the next paragraph), our weighted model estimates the parameters of a marginal structural Cox model (17–19) and can be used to mimic a sequentially randomized trial in which patients were assigned to different epoetin dosing regimens. Each patient in the logistic models received a time-varying weight inversely proportional to the estimated probability of having his or her own observed epoetin dosage history, as described elsewhere (20). These weights were estimated by fitting two nested models: A logistic regression model to estimate each patient's probability of not receiving epoetin at any given month (7.3% of the patient-months had zero dose) and a linear regression model to estimate each patient's density (assumed to be normal) of log epoetin dosage among those with nonzero dose in that month. Both models included the covariates listed already for the mortality model plus the following time-varying covariates measured during the previous month: Hematocrit (<24, 24 to <27, 27 to <30, 30 to <33, 33 to <36, 36 to <39, and ≥39%; most recent hematocrit levels were carried forward when hematocrit value was missing), inpatient days (0, 0 to <4, 4 to <7, ≥7), iron treatment (yes, no), and log epoetin dosage (cubic splines with five knots located at 5.5, 9.5, 10.5, 11.5, and 13.5, which correspond to weekly epoetin dosages of 60, 3340, 9100, 24,580, and 182,350 U, respectively). The model also included product terms between log epoetin dosage spline variables and time-varying hematocrit and between chains and both baseline epoetin dosage and time-varying epoetin dosage (because chain characteristics are associated with epoetin dosing patterns ). Inverse probability weights were also computed to adjust for potential selection bias as a result of censoring. Both the epoetin and censoring weights were stabilized and their product was used to fit the weighted regression model. Because Medicare does not reimburse separately for epoetin treatment in the hospital, no data on inpatient use are available. Furthermore, there are no empirical studies on inpatient epoetin use, and anecdotal evidence varies widely regarding how often and how much epoetin is prescribed to dialysis inpatients; however, because patients with longer hospital stays might be more likely to receive some epoetin, we selected a primary analysis in which patients with >4 inpatient days were assumed to receive the same epoetin dosage from day 5 onward as they received during their most recent preceding outpatient dialysis period (per dialysis session). We also conducted two secondary analyses: Analysis A, which assumes that epoetin was given throughout the duration of the hospital stay, and analysis B, which assumes that epoetin was not given during a hospital stay, regardless of the duration. All analyses were conducted with SAS 9.1 (SAS Institute, Cary, NC). Figure 1 depicts the selection process for the patients who were included in the analysis. The final cohort consisted of 18,454 patients. The demographics, clinical history, comorbidities, and baseline anemia management of the study population are shown in Table 1. The study cohort was 51% men, 69% white, 47% with diabetes, and 63% with cardiovascular comorbidities. During the first 3 mo on dialysis, the average weekly epoetin dosage was <10,000 U in 11% of the patients, 10,000 to 20,000 U in 36%, 20,000 to 30,000 Us in 30%, and >30,000 U in 24%. At the start of follow-up, 83% had a hematocrit ≥33%, 60% of the patients had a hematocrit ≥36%, and 35% had a hematocrit of ≥39%. During the follow-up, 4105 (22%) patients died and 4906 (27%) were censored before the end of the study. The mean of the estimated inverse probability weights was 1.05 (SD 5.2), and the 1st and 99th percentiles were 0.06 and 6.20, respectively. Selection of study population from US Renal Data System (USRDS) data. Figure 2 shows the estimated survival functions under three hypothetical dosing levels: 15,000 U/wk, 30,000 U/wk, and 45,000 U/wk throughout the entire follow-up. Our primary analysis estimated similar survival at 9 mo for all three dosage levels. Secondary analyses indicate that survival probabilities vary depending on assumptions of epoetin use during hospitalizations. 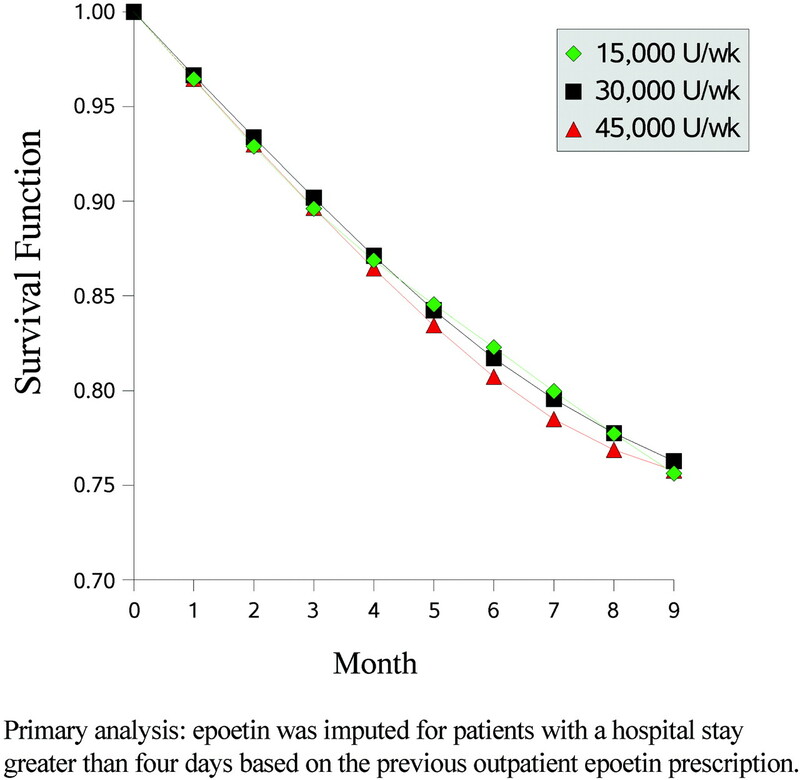 Specifically, the lowest epoetin dosage (15,000 U/wk) resulted in the highest survival when assuming that epoetin was used throughout the hospital stay (analysis A; see supplemental information available online at http://www.cjasn.org) but in the lowest survival when assuming that epoetin was not used in hospital at all (analysis B; see supplemental information available online at http://www.cjasn.org). The main features of the estimated epoetin dosage-survival curves were not sensitive to the particular functional form used for cumulative average dosage (results did not change when we used cubic splines with knots at different locations) or to alternative summaries of dosage history (i.e., total cumulative dosage from start of follow-up, recent and past cumulative average dosage). Survival probabilities for three hypothetical regimens: Low dosage (15,000 U/wk), medium dosage (30,000 U/wk), and high dosage (45,000 U/wk). Table 2 presents the estimated average HRs during the entire follow-up from our weighted model under different assumptions regarding the use of epoetin during hospital stays. These average HRs are consistent with the survival curves (Figure 2). The HRs for the two lowest epoetin dosage groups are sensitive to the assumptions about epoetin use during hospitalizations, but the HRs for the two highest epoetin dosage group are less sensitive to these assumptions. In the primary analysis, compared with a cumulative average dosage of 20,000 to <30,000 U/wk, the HR estimates (95% CI) were 0.91 (0.67 to 1.22) for ≥40,000 U/wk, 0.96 (0.76 to 1.21) for 30,000 to <40,000 U/wk, 0.84 (0.67 to 1.05) for 10,000 to <20,000 U/wk, and 0.90 (0.52 to 1.54) for <10,000 U/wk (P = 0.83 for trend). Our estimates did not materially change (data not shown) when we used alternative categorizations of hospital days and hematocrit values, when we expanded our billable service gap definition from 30 to 60 d, when we did not censor on change of provider, when we used different knots’ locations for splines of log epoetin dosage, when the estimated weights were truncated to a maximum of 20, and when the weights were estimated under a γ distribution for the log of epoetin dosage. We also tested the effect of using a log scale to compute the cumulative epoetin dosage. In the primary analysis, compared with a cumulative average dosage of 20,000 to <30,000 U/wk, use of the logarithmic scale resulted in HR estimates (95% CI) of 1.15 (0.92 to 1.44) for ≥40,000 U/wk, 1.06 (0.86 to 1.31) for 30,000 to <40,000 U/wk, 1.00 (0.83 to 1.20) for 10,000 to <20,000 U/wk, and 0.81 (0.56 to 1.17) for <10,000 U/wk (P = 0.19 for trend). Compared with the primary analysis in Figure 2, the 9-mo survival estimated using the log-transformed dosage was similar for the lowest dosage group (15,000 U/wk) and 4% lower for both the middle and higher dosage groups (30,000 and 45,000 U/wk). For comparison purposes, Table 3 shows the corresponding estimated HRs from standard unweighted models that include the measured time-varying confounders as covariates. In both the primary and secondary analyses, these standard Cox regression models suggest that mortality risk increases with epoetin dosage. We used data from an elderly hemodialysis population to answer the question, “What would be the survival if every patient were to receive the same epoetin dosage during the entire follow-up?” We found no indication of a harmful effect of higher epoetin dosages on survival during months 4 through 12 after dialysis initiation among patients aged ≥65 yr, who comprise 50% of the patients with newly diagnosed ESRD and one third of the prevalent hemodialysis population. Our finding of no harmful effect of high dosages is unlikely to be explained by unmeasured confounding by indication, because better confounder measurement (e.g., more frequent hematocrit measurements or information on other prognostic factors such as nutritional status, BP, or inflammatory state) would be expected to result in effect estimates that are further from a harmful effect because patients who receive higher dosages tend to be those with more severe disease. The concern about the relationship between high epoetin dosages and mortality has been raised by the seeming paradox between the association of higher hematocrit levels with better survival found in observational studies (3–7) and the adverse effects of targeting higher hematocrit levels found in randomized clinical trials (1,2). Because in observational studies higher hematocrit levels are associated with lower epoetin dosages, whereas in randomized trials the group assigned to higher hematocrit targets receives higher epoetin dosages, some observers have suggested that mortality might be related to epoetin dosage rather than achieved hematocrit level. In fact, several extrahematopoietic effects of epoetin administration, particularly worsening of hypertension, might account for an increased mortality as a result of higher epoetin dosages (22); however, all studies that suggested increased mortality with higher epoetin dosages (3,4,5,7), including our own (6), and a recent secondary analysis of a randomized trial (10) used standard adjustment techniques. (Another study found that the estimates were sensitive to modeling assumptions .) These analyses might not have appropriately adjusted for time-varying confounders that are affected by past epoetin use and that might be on the causal pathway between epoetin use and mortality. These confounders include hematocrit level (the major determinant of epoetin dosage in clinical practice) and previous hospitalization (a key prognostic factor for death). In this study, we confirm the previous observations that higher epoetin dosages are associated with increased mortality when using standard adjustment techniques but were unable to show a harmful association between high epoetin dosage and mortality when we used inverse probability weighting to adjust for measured time-varying confounders. A limitation of our study is the lack of data on epoetin use during hospitalizations. Our analysis suggests that the estimated survival at lower epoetin dosages is quite sensitive to assumptions regarding epoetin use in the hospital. Future studies that provide more details regarding inpatient epoetin use are needed to determine the mortality risk associated with low epoetin dosages; however, regardless of the uncertainty for mortality under low epoetin dosages, we did not find strong support for an effect, either harmful or beneficial, of high epoetin dosages on survival. The results of our study may not be generalizable to patients other than those included in the analysis, who were ≥65 yr, incident to dialysis and survived the first 90 d of dialysis, and are dialyzed in free-standing facilities. Furthermore, our analysis included only limited center-specific attributes (profit and chain status), and center effects may be associated with epoetin dosing as well as mortality. Our findings address but do not fully resolve the seeming paradox between observational studies and RCTs regarding the effect of hematocrit on mortality. The discrepancy might be explained by a modification of the effect of high epoetin dosages by patient characteristics, which differ for patients who are included in observational studies compared with those who are included in RCTs: One of the RCTs enrolled patients who had chronic kidney disease and were not on dialysis, and the other included prevalent hemodialysis patients with underlying cardiovascular disease. Additional appropriately adjusted analyses of observational databases, as well as randomized clinical trials, are necessary to understand the relationship among epoetin, hematocrit, and survival and help design treatment algorithms that maximize benefit. All authors participated in the design, analysis, interpretation, writing, and/or editing of this study and have seen and approved the final version. Y.Z. had full access to all of the data in the study and had final responsibility for the decision to submit for publication. J.K. has served as a consultant and receives financial support from Amgen and F. Hoffman-La Roche. This project was funded in part by National Institutes of Health grants R01-DK066011-01A2 and R01-HL080644-01. The National Institutes of Health had no role in the study design; in the collection, analysis, and interpretation of data; in the writing of the report; and in the decision to submit the paper for publication. The data reported here have been supplied by the US Renal Data System. The interpretation and reporting of these data are the responsibility of the authors and in no way should be seen as the official policy or interpretation of the US government.